Heater type- Daimer 200 S uses a “replaceable” heating element. This is true that they say some steam cleaners have the heater and boiler all in one will cost more to replace if not under warranty. We know that all too well. However, ANY internal heater in time may corrode and lose heating capacity as it develops calcium deposits and corrosion. Replacing an internal heater can be problematic. The new one needs to be sealed perfectly and tightened to correct torque specs. Steam pressure settings- Daimer 200S They do not say. 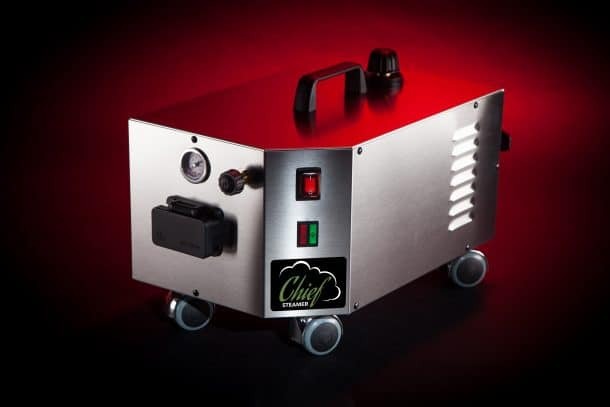 Chief Steamer Single 75, infinite pressure adjustment. We use a regulator valve that delivers the volume and pressure from zero to full blast. You control it from the valve and we eliminate extra electronic solenoids. Horsehair brushes– Daimer 200S has none lsited. Chief Steamer Single 75 has 2 of each size. We have found that horsehair is the preferred brush to clean leather and most vinyl surfaces without doing damage.